Ear Piercing? What age is too young? Newsflash: A hole through a child’s ear does not a girl make. This has to be the most absurd argument. There are many men with ear piercings. There are many girls with no ear piercings. There are other ways to communicate her gender, like dressing her in girl-oriented clothing. But even if you dress her in the girliest of clothing, people will still ask whether she’s a girl or boy. It just happens. To be pretty. Isn’t your daughter pretty enough to not warrant pushing metal through her ear? Why does she have to, at such a young age, be forced to conform to societies “views” on beauty? An infant is not something for you to accessorize or add permanent adornment to. She is perfect and beautiful just the way she is. Ear piercing will not make her any prettier, or give her a head start in any way. It’s easier to take care of: Not true. Infants tug at their ears, and are naturally messy beings. And if you wait until she’s old enough to take care of them herself when you get them, it will be even easier to take care of than having to deal with an infant’s flailing arms, tugging hands, and healing pains. She won’t remember it: She probably won’t remember the actual piercing, but that doesn’t make it okay. She will have holes in her ears for years because YOU wanted them there. If she won’t remember it, why don’t you go ahead and get three holes in her ears? Or her nose? Body modifications are serious, and should be only done by a professional piercer. Simply google “Piercing gun mistakes” or “Piercing gun”, and you’ll find nothing but warnings to sway you away from the teenager wielding a piercing gun at your local mall. Not only are they not trained, but they’re not staffed for emergencies, or well-trained on hygiene or aftercare. A piercing gun creates more damage than a regular needle, and leads to problems down the road. Piercing guns as a whole should be banned. For more information about the dangers of piercing guns, read this. Your daughter may very well not want her ears pierced. In this case, you’ve made a choice for her, and she may hold resentment about it as she gets older. It is absolutely impossible for you to know if your infant daughter would like them done. Infant’s bodies are already fighting off infection left and right, so why make it harder on them by introducing more potential for infections into their earlobes? Many infants will have numerous piercing infections during their beginning years. Your child may also have an allergic reaction to nickel or other metals. 35% of people have side effects from ear piercings, and I would say that the numbers in infants are higher, whether it’s infection, tearing the earring out of the ear during play or sleep, or keloid formation. Infants and small toddlers aren’t known for being gentle. Tempur tantrums and run-ins during play may very well cause problems with any ear piercing. Many daycares and child care centers forbid earrings for this reason. And let’s not forget the choking hazard. While there are infant-friendly studs, there isn’t any 100% safe earring. 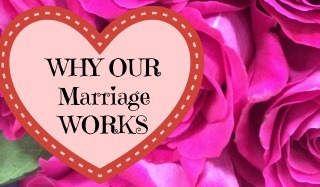 The most important reason: It’s not YOUR body to modify for cosmetic reasons. Ear piercing should not feed your vanity or your definition of “pretty”. 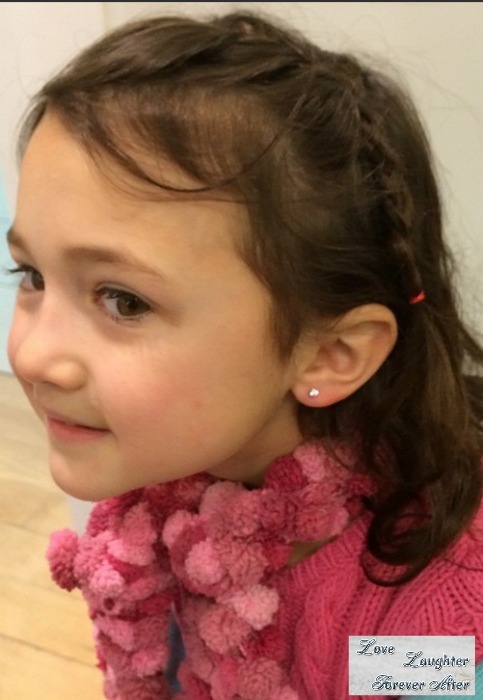 Getting your daughter’s ears pierced should be special, and something that she genuinely longs for, and looks forward to. Wait until she’s old enough to make the decision herself, and care for it herself. I have fond memories of my girl’s day out with my dad. It ended in me getting my ears pierced. I believe I was 5 or 6. I also know my mom wasn’t as excited as I was when we got home. I knew from the moment I had a little girl that one day I would get her ears pierced. Before she was even born I bought her 23 pairs of shoes. I just couldn’t help myself. I hoped the need to accessorize would hopefully transfer to my daughter. I decided she would get her ears pierced around the same time I did. I asked her if she wanted them done and to my surprise she told me “No, Thanks Mama.” I was crushed. I had gone through all my old earrings and had them in a box for her to borrow. I was suddenly sad. I had this whole special ear piercing day planned and with the word “No” it all ended. It taught me two things what I want for my daughter will not always be what she wants. The second thing it taught me is she is her own person and when the time is right she will ask me to get her ears pierced. That day happened last week. I was so excited and so was she. We are now in the earring turning stage and we are both pleased with her newest accessory. Gina Says: Now it is your turn! What do you have to say about ear piercing? 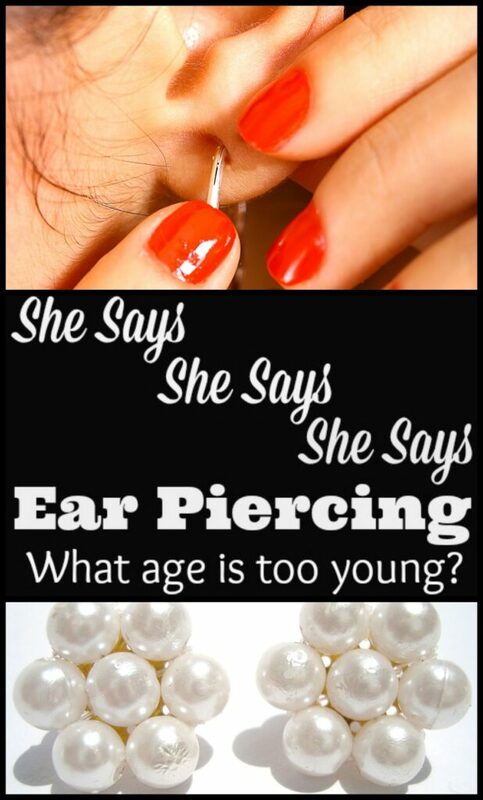 What age do you think is okay for parents to have their daughter’s or sons ears pierced? Share your thoughts below. She Says is a place where the writers at Love Laughter Forever After share their opinions and thoughts on just about any topic. Is there a burning issue, question or topic you want us to tackle? You can leave your suggestions for future topics in the comments below. When should kids learn to tie their own shoes?